Any dog collar mainly serves two functions. It helps to keep the ID tag attached to the dog at all time in case it gets lost. Also, it is where you attach the leash when you go out for a walk with him. A collar and a leash are crucial devices to ensure your dog’s safety. Otherwise, a peaceful morning walk can result in an accident as your dog might get lost or hurt if he runs away. Thus, it is crucial that you make sure he doesn’t damage anything or hurt anyone while also ensuring that he remains safe and doesn’t get lost. A comfortable collar is a necessity as it will do just that. There are various types of collars on the market, from standard side ones to chain chokers. However, the Martingale Collar has seriously changed the game. Where chain choke collars can severely hurt your dog, the martingale is much gentler. Yet, it still gives you a lot of control. Martingale Collars are actually a variation on choke chain type of collars; however, they are much safer and more comfortable. They were specifically created for dog breeds with small heads and large necks such as Whippets and Greyhounds. Due to their small heads, these dogs could easily slip out of their collars. However, the martingale ensures that the collar never slips up. They are effective training collars and help reduce pulling and tugging. Moreover, they are loosely fitted and only become tight when the dog pulls on the leash. It basically consists of two loops. The first is a traditional nylon loop that goes around your hound’s neck. The next is a smaller loop which may be constructed out of chain or nylon. There is a D-ring on this loop and the leash attaches to this ring. 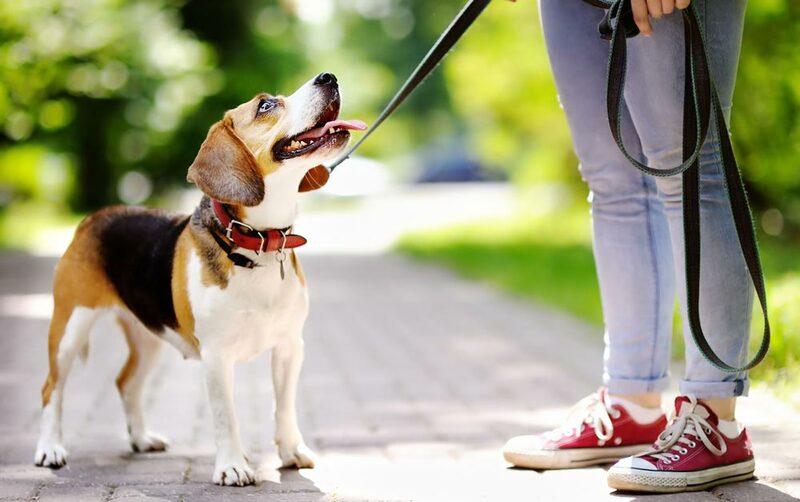 When your dog pulls on the leash, the collar immediately tightens to a certain extent. The most notable point here is that the collar doesn’t tighten enough to damage your dog’s neck. When the dog stops trying to pull and tug, the collar automatically loosens. This can help in training your dog as the tightening will heavily discourage him from pulling on the leash. PetSafe is a popular brand among many dog owners. Their Martingale Collar is available in about five sizes as well as five different colors. They feature a durable and sturdy nylon construction that ensures the collar lasts for a long time. While it tightens to give you the ultimate controls, it still remains loose enough to allow breathing room for your dog. It also has a plastic holder where you can hang tags instead of the D-ring. All in all, it is a great alternative to choke collars. Another premium brand with a high-quality product, the If It Barks Martingale collar features a 1.5-inch wide collar with a durable nylon construction. The nylon has a very thin profile which makes it stretchable and thus, much more comfortable for the dog to wear. The Collar was handmade in the USA, ensuring the highest-quality craftsmanship in the market. The best part is that the collar is available in a number of sizes and colors. Not only that, it is available in two different styles which are the buckled version and the slip-on version. due to the high-quality materials used. The collar is actually constructed from Amish Harness Leather. This happens to be a heavy-duty material that is 1-inch wide. Moreover, the metallic buckles and rings feature a nickel construction with a steel coating. These are available in about two colors and three sizes. This variation of the martingale collar is specifically to ensure that the dog doesn’t slip out of the collar. They are perhaps the most popular type on the market. When your dog pulls on the leash or tries to back out of the collar, the collar immediately tightens evenly. However, the fixed loop limits the choking action so that it doesn’t damage your dog’s neck. They usually consist of two nylon loops or two loops of other fabrics. Their main advantage is that they do not tighten after a certain point. The Half-Check Dog Collar is actually a combination of a nylon martingale collar and a choke chain one. The main loop that goes around the neck is made of nylon or some other fabric while the second loop is made of metal chain. This adds to the durability of the collar and ensures a longer life. They make for much more effective tools than their full-fabric counterparts. This is because the tightening action is accompanied by the sound of the chain. Pet owners can simply train the dog to associate the sound with danger or something negative. So, their dogs would be more deterrent to pull on the chain. The sound of the chain will alert you as well that your dog is trying to back out of the collar. In addition, this collar doesn’t tighten all the way through so your dog remains safe. This ensures a safer and more humane way of training your dog. As a result, they are also known as training collars. Depending on the texture of their fur as well as the shape and size of their heads, some dogs can easily slip out of collars. A martingale collar effectively stops this by tightening around the dog’s throat. Dogs with narrower heads such as Whippets, Shelties and Greyhounds would benefit a lot from these collars. When the martingale collar tightens around the neck of the dog, it might force him to stop pulling and tugging and that’s when it becomes loose again. So, the dogs associate the uncomfortable tight feeling with pulling and tugging. In the same way the dog gets positive reinforcement with treats and dog food, they get the mild punishment for negative behavior with a collar. Dogs who have trouble following leash manners will likely benefit from these collars. The best part is that these are humane as they do not fully choke the dog. Another reason to choose the martingale is that the other options in the market are too inhumane. A choke chain collar may choke and hurt your dog. Also, this is perfect for cases where you only want slight control. The martingale collars are available in a number of different colors and styles. This allows you to choose from a variety of collars. While the martingale collar seems to be almost perfect in all respects, it isn’t without its drawbacks. More Comfortable: The number one advantage of the collar is that it is much more comfortable for your dog than the other standard collars. Mostly, his skin is protected from the cold metal. Gentler: The fabric construction and the limited choking allows the collar to be gentler to your dog. No Choking Hazard: Since these collars tighten only to a certain extent, you need not to worry about choking or excessive tightening. Helps Training: It reduces the tendency of the dog to pull on the collar. Not Effective for Bull-Necked Dogs: These collars are not quite effective for bull-necked dogs as they do not have much of an impact on them. Also, they are not recommended for extremely small dogs. Dangerous When Left Unsupervised: If you leave the collar on your dog without supervision, there are higher chances that your collar will tighten. Furthermore, the collar might get stuck somewhere and tighten itself, causing your dog to choke. This is only to be used when walking or when outside and not as an everyday collar. Measure the largest part of your dog’s head. This could potentially be measured from the back of his head to the edge of his snout. Next, measure the diameter of the middle of his neck. If you find that the head is much larger than the neck, then use the head to determine the accurate size. Otherwise, use the neck for an accurate size. For larger dogs, we recommend that you add two inches to the measurements while for smaller digs, add about 1.5 inches. This added measurement is the size of the collar that is accurate for your dog. For these, you only need to measure the size of the neck. Like before, add two inches to the measurement if you have a larger dog and 1.5 inches if it’s a smaller dog. There you have it! This is the accurate size of the collar you should buy. Another point to consider when picking out the accurate size of the collar is the width of the collar. While width may not be a big deal with some dogs, it may be crucial with others. If you have a small necked dog, then picking out a wider collar can result in choking. Also, wider collars tend to be much heavier and bigger while collars that are too thin may be less durable. Open the collar up to the largest size possible. Place it around the dog’s neck and buckle it down if it’s a buckled collar. Use the adjustment points on the collar to tighten the collar. However, ensure that the collar is not too tight. You can easily check by inserting two fingers between the collar and the dog skin. If they go in comfortably, then the fit isn’t too tight. Attach the leash to the D-ring. If the two O-rings on the collar are too close together, then the collar may be too tight. Ideally, they should be far apart and the D-ring should be exactly between them. When using a martingale collar, it is essential that you consider the safety of your dog. While they are safety and training collars combined into a single collar, you still need to be careful when using them. They can be a cause of danger to your dog, if not used properly. Choose the best fit collar. This might be a little obvious, but you need to ensure that the collar fits the dog perfectly. It should be comfortably snug around the neck and not too tight that it causes choking. Ensure that when you put on the leash the two O-rings are far apart and the D-ring is in centered perfectly between them. Otherwise, your dog may easily slip out of them or choke. Do not leave your dog unattended with the Martingale Collar. Ensure that your pup is always with you when he wears the collar. Furthermore, it should be noted that the collar is to be used with a leash. Without the tension of the leash, the dog can easily slip out of the collar. Also, the dog may chew through it. Introduce the collar in a familiar environment. The martingale collar is intended for when you’re walking your dog out. It should not be used as a regular everyday collar. However, when you first put it on, do it at the safety of your home and allow your pup to get familiar with this collar. If you leave your pup outside with the collar on, then he can easily get it stuck on a branch or a fence. When he tries to pull himself free, the collar will start choking him. Thus, ensure that you never let him out with the collar unsupervised. Do not put the collar on while he is in his kennel. If your dog stops responding to the collar or there seems to be no improvement in his leash manners, then discontinue the use of the collar immediately. There is no point to it if he is not learning. The added pressure against his throat may be a huge deterrent. We recommend that you check with a vet first before using the collar. You could end up doing more harm than good. What to Consider When Buying a Martingale Collar? Is the collar comfortable against your dog’s skin? Is it irritating him? What materials did the manufacturers use in making it? Does the collar fit perfectly with my dog’s neck or head? Does this brand come with accurate sizes and if so, then how much can they be adjusted? Is it durable and sturdy? Or will it start fraying at the sides? Does the collar come with a buckle or is it a slip-on collar? If it does come with a buckle, then which buckle might be the best. 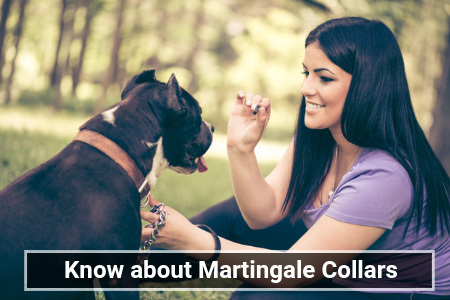 Martingale Collars are the perfect solution to your training and walking needs. They ensure that your dog behaves while out on a walk. Furthermore, they heavily discourage any pulling and tugging, making walks much more enjoyable. There are many products in the market, out of which we have chosen and reviewed our top two. Of course, every dog is different and has different needs. You might find other collars that suit him much better. Who says training dogs has to be tough? With a Martingale Collar, your dog will go from a tramp to a gentleman. 1 What Is a Martingale Collar? 5 Why Should You Use a Martingale Collar? 9 What to Consider When Buying a Martingale Collar?